Digital Cinema Package, as the name suggest is a package of number of files that are needed to playback a movie on a cinema projector. Digital Cinema Package or DCP (in short) consists of MXF and XML files that are read by Digital Cinema Projector. MXF is the widely used format and XML files consists of some information related to the movie and it helps the projector to understand the contents of the package. Digital Cinema Packages are the modern and advance version of earlier used cinema packages which comes in 35 mm reels. A DCP comes in a linux formatted hard drive or it can be streamed using satellites. The advantage of DCP over cinema packages is that the quality of a movie always remains the same. Also it is much cheaper to create a Digital Cinema package and one can easily do so even with a Home Computer. There are plenty of software’s available on the internet such as OpenDCP. To know more about how you can create Digital Cinema Packge, refer to the article How to Create DCP or Digital Cinema Package With OpenDCP. Though it is very easy to create a DCP on a home computer, but it is comparatively difficult to test it, mainly due to difference in the color space. If you use Adobe Premier Pro, FCP (Final Cut Pro) or After Effects for editing and rendering, then the output files will have its source color parameters as sRGB. Similar to the color parameters of your computer. 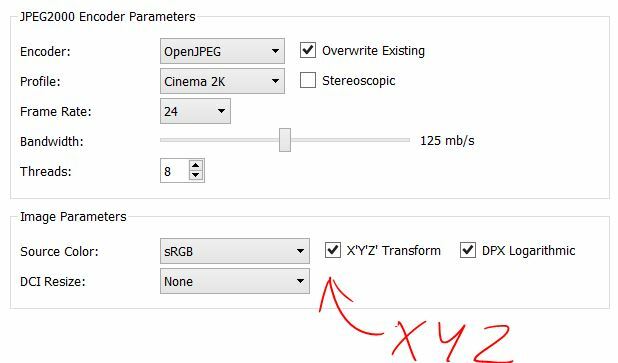 But, in order to get the correct color space on a Digital Cinema Projector, the files need to be processed through X’Y’Z’ Transformation. Don’t worry, the process is not that complicated as it sounds. Your DCP software will handle the job for you. If you wish to use OpenDCP for creating Digital Cinema Package’s, you will find the color space transformation options under the Image Parameters section. Now, when it comes to testing a DCP, your normal Media player will not be able to play the file for you since VLC or Windows Media Player does not play .MXF file formats. Earlier when I created my first ever Digital Cinema Package, I was really confused how I am going to test it since it was not possible for me to visit my nearby theater and get testing permissions. After searching a bit online, I found a software called Stereoscopic Player. Stereoscopic player is basically used to test 3D video’s and it can also play your Digital Cinema Package. But, the main problem with this media player is that it ignores the source color space of the DCP, i.e. X’Y’Z’ and instead outputs the file in RGB Color Space. The final result is blown out colors. Though your files will play normally on a Cinema Projector. Although we know that a DCP created with OpenDCP will give play normally in a theater, still one should be sure about the output before delivering the files. The software which helped me do so is Neo DCP Player. 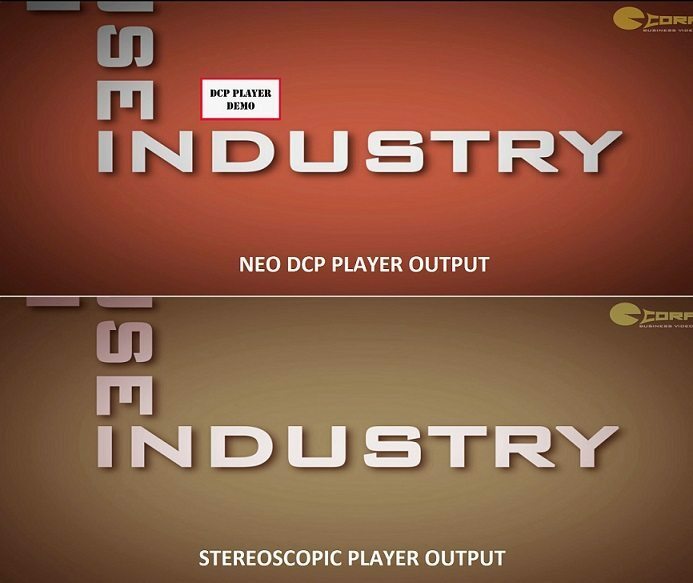 Neo DCP player outputs the same colors as a Cinema Projector. It gives you very accurate results but you need to spend few dollars to purchase the software. You can also use the trail version like me if you just want to test the colors instead of watching the entire content of your DCP. In above image, you can easily see the difference in color. The output from Neo DCP Player is accurate and Stereoscopic Player completely blown it away. The trial version of Neo DCP player will stick a DCP Player demo mark on the screen but it is completely negligible if you want to use the software for testing only. Once you get the correct color output with Neo DCP Player, your Digital Cinema Package will perform well with the Digital Projector too. Make sure to double check the Image Parameters while creating the DCP.